Whether your eyes feel so itchy you want to claw them out or you look like you pulled the world’s longest all-nighter, you shouldn’t just slap on a pair of sunglasses and ignore it. Eye issues should be treated properly to avoid complications, especially if there is pain, light sensitivity, discharge, or any symptoms that persist. Here are common eye problems and what they could mean. A chalazion is a benign, painless nodule or bump inside the lower or upper eyelid. This cyst-like nodule forms around an oil gland within the eyelid, causing redness and swelling. Chalazia (plural for chalazion) come from healed internal styes that are no longer infectious. Styes result from an infected eyelash follicle and may ooze pus. The first line of treatment for both styes and chalazia is a warm compress. Apply a warm, moist washcloth on the area to encourage drainage. If you are prone to developing chalazia, your doctor may advise for preventative regimens, such as applying medicine on your eyelid and cleaning it. Your ophthalmologist may also prescribe topical and oral antibiotics like tetracycline and doxycycline. In the case of persistent and bothersome chalazion, you may undergo a simple in-office surgery to excise it. Experiencing these symptoms could mean you have conjunctivitis. This is the result of swelling of the conjunctiva, the clear layer of tissue that covers the white part of the eye and lines the inner surface of the eyelid. 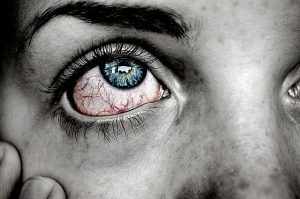 Also known as “pink eye,” conjunctivitis may cause discoloration and irritation on one or both eyes. Your physician can do a culture to see if it’s bacterial or viral. A case of bacterial conjunctivitis usually goes away on its own, but antibiotic eye drops can help speed up recovery. The viral variety of the condition is extremely contagious. To relieve irritation, use cold packs and individual vials of artificial tears. It could be dry eye, a condition in which a person doesn’t have enough moisture to nourish the eye. Tears play a role in providing clear vision and keeping the health of the front surface of the eye. Dry eye is a common and often chronic problem, especially in older adults. You can manage a mild case of dry eyes with an over-the-counter artificial tear solution. If your condition doesn’t respond to artificial tears, you will need to take additional treatment. Your optometrist might recommend prescription ointments or eye drops, lid massage, and warm compresses, or eyelid cleaners to help decrease inflammation around the problem area. Consider getting a humidifier to increase the humidity in your room and keep your eyes moist. Blinking more frequently may also help. Seeing your eye doctor regularly is the best way you can ensure healthy vision for years to come. Take note that any eye symptom that doesn’t clear up warrant a call to a specialist.